My husband and I used our vacation money this year to buy a sleep number bed. Dual chamber. It's pretty great, actually, and a king size. We'd been huddled up in a queen-sized torture chamber for nearly five years now and it was time to make a change. If you've never been inside a sleep number store its pretty fun. They put you on one of their beds and you play with the buttons, making yourself go up and down, kinda like a hospital bed but its more internal. You can actually feel your organs being sucked in. I'm thinking it might be a good way to lose some weight. a little theatre over your head as you are testing it out). Once you hit 'your ideal sleep number' all the red lines go away and its green sailing from there on out. So we got it and I have to say I love it. We each have our own sleep number side. The middle area is a battle ground. I'm not sure why but my body has recently rebelled against sleep. At least lying down. I wake up in more pain and more tired than when I went to sleep. Now with my handy dandy vacation-costy bed, the pain is at a minimum. So worth it! There's a remote that controls your number. 100 is as firm as it gets. Then you can soften it all the way down to zero. Made me wonder. Wouldn't it be awesome if they had a similar invention for wives to use on their husbands? 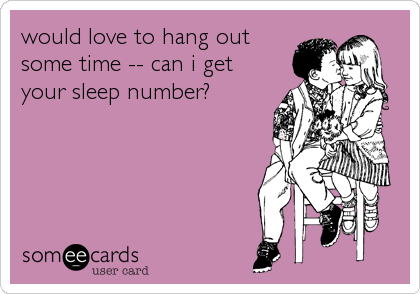 On some nights, we'd crank him up to 100. On the nights we just want to watch Heart of Dixie and eat ice cream, deflate that sucker till he's an innie. Oh, well, I can dream. For now I can at least operate my bed.